For resource-dependent communities, such as many First Nations in British Columbia, climate change may increasingly compound existing vulnerabilities as the availability and quality of natural resources that they heavily depend upon decline. Limited resources and capacities for responding to stresses, such as wildfires, floods, and droughts will increasingly constrain their ability to meet basic needs and become self-governing. There is, therefore, an urgent need to begin reducing current vulnerabilities and enhancing adaptive capacity of the communities so that people of these communities can face the longer-term impacts of climate change with resilience. The Xeni Gwet’in First Nation is one of six Tsilhqot’in communities in the Cariboo-Chilcotin, occupying one of the last intact ecosystems on the east side of the Chilcotin range. 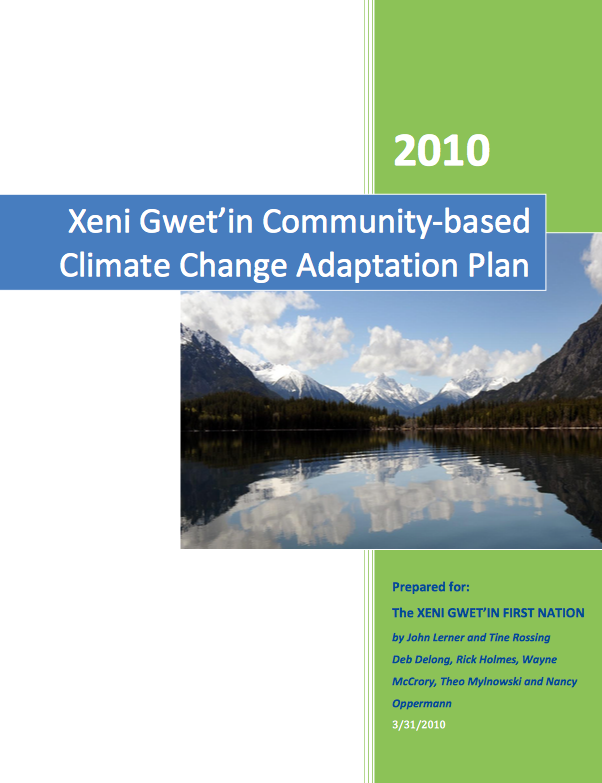 While the community is relatively dynamic and healthy, it is still healing from the effects of colonization and the residential school system, and it is increasingly experiencing stress over resource use conflicts in their traditional territory (Xeni Gwet’in Caretaker Area) and some of the early impacts of climate change (forest fire and fish stock declines). These impacts alone have left the Xeni Gwet’in somewhat anxious for their future but also determined to face it on their own terms. They envision a development and human activity in the Xeni Gwet’in Caretaker Area, which is grounded in an ecosystem-based approach to land use, minimizing human impact on the land and waters, leaving it as much as possible as a self-sustaining, wild environment with clean water, clean air and abundant fish and wildlife.